Once fitting your car out with a bluetooth car kit was about as futuristic as you could get, not anymore though. Car tech has expanded and Apple and Android are making a play for your dashboard, hoping to add some serious functionality and make long journeys full of car games a thing of the past. Only a handful of manufacturers have committed to offering Apple's answer to in-car entertainment on upcoming models but the list is constantly expanding. But what makes it so good? 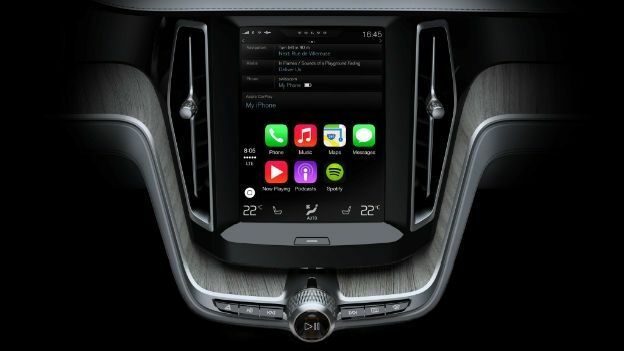 Well, it's typically Apple in its simple yet intuitive approach to things, allowing drivers to access certain car-friendly applications from their iPhone, which are then displayed on a dash-mounted display. Access iTunes, receive turn-by-turn instructions from Apple Maps and have Siri read out text messages for you. Fiat, Audi, Citroen, Jaguar, Ford and many more have all jumped onboard the bandwagon, while Alpine and Pioneer will soon be offering CarPlay-enabled head units to the aftermarket. Apple may have been first to the whole in-car smartphone-tethering thing but Google is never one to rest on its laurels. That's why 40 carmakers from around the world have already signed up to Android Auto, which will slowly begin to surface towards the end of this year. Features-wise, it's much the same as CarPlay, with Android users able to access a number of apps on the go. But perhaps the biggest coup is the ability to use the brilliant Google Maps as a navigational tool. When demoed at this year's I/O conference, Android director of engineering Patrick Brady revealed Google Map's ability to register and answer voice commands, such as "what time does the Post Office close," as well showing off its intelligent memory, which allows the user to bark "navigate there" rather than having to repeat the destination. The system is predicted to usher in a hands-free era where we are no longer risking an insurance claim because we're constantly fiddling with phones. The cutesy styling and daft advertising campaigns will undoubtedly put some people off purchasing a Mini but it's a well-known fact that Mini Connected is one of the best value in-car entertainment systems out there. A massive 8.8-inch display can be specified, which sits neatly in the new center stack and controls everything from music to navigation. Connected allows smarthpones to be tethered, Facebook to be logged into and tweets sent (even when on the move thanks to voice command functionality). Spotify is available and Mini has even created bespoke apps, one of which monitors driving styles and selects an appropriate musical soundtrack. Prices start at around £1300 but it's an absolute must for those who like their gadgets. The dashboard in a modern Ford might not be the prettiest thing but it is arguably one of the smartest. The latest SYNC technology allows mobile devices to be quickly and easily connected; meaning phone calls and music are just a few voice commands away. An improved SYNC with AppLink lets you connect your iOS or Android smartphone to your car, allowing access to a number of apps. Text messages can be read aloud - as long as the phone is compatible - and in the event of an accident, the car uses your mobile device to contact the emergency services and send GPS coordinates. George Orwell wouldn't approve but your loved ones might. Just £9,495 buys the all-new Citroen C1, and while this tiny city car isn't to everyone's tastes, it is undeniably practical and now impressively tech-savvy thanks to Mirror Screen technology. In short, it works much like Apple' CarPlay in so much as you plug in your smartphone and then stare in amazement as a number of apps are beamed to the 7-inch touch screen. It's isn't as slick as Silicon Valley's efforts but a number of smartphone brands are compatible and it allows the driver to stream music, make calls and run a number of mapping applications. The unveiling of the upcoming Audi TT's spectacular TFT dashboard at CES earlier this year also brought with it details of Audi connect, a service that will access the internet, 'talk' to local infrastructure and even other cars. The Audi connect module uses mobile broadband Internet access so occupants not only get their very own wireless hotspot but also up-to-date news and traffic information. The car will be able to 'talk' to road furniture, such as traffic lights, and analyse the perfect speed at which to cruise through the next sequence. Every connect-enable Audi will also be able to feed traffic information back to the cloud, allowing the intelligent navigation system to quickly work out alternative routes should another road user report an accident.